FARA intends to apply part of the proceeds for the following consultant services: TO ENGAGE AN INDIVIDUAL CONSULTANT TO UNDERTAKE LUMPED EDITORIAL SERVICE FOR THE FARA SECRETARIAT. FARA complements the innovative activities of national, international and sub-regional research institutions to deliver more responsive and effective services to its stakeholders. 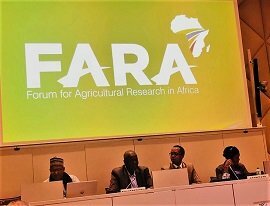 It plays advocacy and coordination roles for agricultural research for development, while the national agricultural research systems (NARS), advanced research institutions (ARIs) and international agricultural research centers (IARCs) develop and promote the adoption of improved technologies and policies along the research-to-development continuum in their respective countries and jurisdictions. The objective of this assignment is to ensure that FARA’s publications are prepared for printing in a timely fashion, and that they adhere to house style and professional business English. Specifically, the consultant will undertake the following tasks. The editor must ensure that FARA house style is adhered to, that all technical names are correct, and that the material presented is politically neutral. Punctuation, capitalization and the general appearance of the document must be consistent and correct. All references must be thoroughly checked. Proofreading. This is the last stage of editi The editor reads through the entire document, checking for consistency and accuracy. Of importance are the table of contents and the list of acronyms. The consultant will produce the edited, typed set and final Report in Word and other appropriate versions, ready for the printing. The duration of this assignment is ONE year. The assignment will be carried out at the home office of the consultant and outputs submitted to FARA Secretariat in Accra, Ghana. The Consultant is expected to undertake the services with the highest standards of professional and ethical competence and integrity. The Consultant should be able to deliver the listed assignments in a most effective and efficient manner, within the period of assignment stated in Section D.
The Consulting firm shall report to the Director, Corporate Partnership & Communications.